CULVER CITY, CALIF. (August 27, 2012) - An exciting all-star cast, including Aubrey Plaza (Scott Pilgrim vs the World, TV's "Parks and Recreation"), Mark Duplass (Darling Companion, TV's "The League") and Jake Johnson (TV's "New Girl," No Strings Attached), appear in the witty dramatic comedy Safety Not Guaranteed , coming to Blu-ray(TM) and DVD with UltraViolet(TM) October 16th from Sony Pictures Home Entertainment. The film follows a trio of magazine employees as they embark on a smart and unexpectedly heartfelt journey in search of a mysterious man who put an ad in the paper, seeking a partner for time travel. 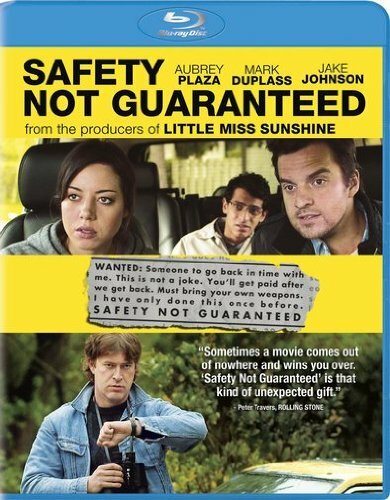 Winner of the Waldo Salt Screenwriting Award, nominee for the Grand Jury Prize at the 2012 Sundance Film Festival and one of the best-reviewed films of the year, Safety Not Guaranteed also stars Karan Soni (TV's "Worst. Prom. Ever. "), Mary Lynn Rajskub (TV's "24"), Basil Harris (Grassroots), David Schultz (Scouts Honor), and Jeff Garlin (TV's "Curb Your Enthusiasm"). Blu-ray and DVD bonus features include two behind-the-scenes featurettes: "A Movie Making Mission," providing a behind-the-scenes look at the making of the film with director Colin Trevorrow and various cast members; and "TheAd Behind the Movie," a look at the original ad that inspired the movie. An unusual classified ad inspires three cynical Seattle magazine employees to go looking for the story behind it. They discover its author is a mysterious eccentric named Kenneth (Mark Duplass), a likeable but paranoid supermarket clerk, who believes he's solved the riddle of time travel and intends to depart again soon. Safety Not Guaranteed was directed by Colin Trevorrow from the screenplay by Derrick Connolly. Derek Connolly, Stephanie Langhoff, Peter Saraf, Colin Trevorrow and Marc Turtletaub produced with Michael B. Clark, Jay Duplass, Mark Duplass and John Hodges serving as executive producers. Safety Not Guaranteed has a running time of 86 minutes, and is rated R for language including some sexual references.